Straight from the "Pasadena" area, this simple Bungalow style features a large dormer at the center front on the roof line. The pale gray house with a combination green tile pine shingled roof add to the authenticity of this classic Cape design. 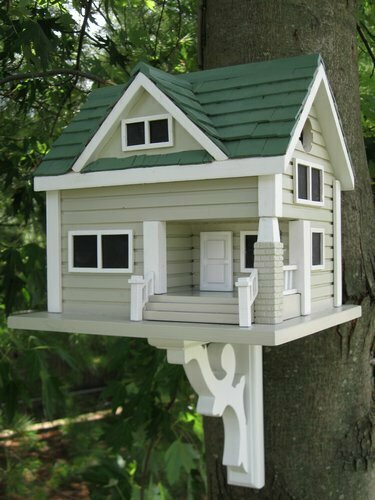 Comes equipped with a mounting bracket to be able to put the house on a post or tree or a fence. 1 �" opening will allow wrens, finches, chickadees and nuthatches to nest. Constructed of exterior grade ply-board, polyresin details, pine shingles for the roof and a non-toxic outdoor paint. All of our pieces are intended for use outdoors. Each is fully functional, with removable back walls for easy cleaning. The hole openings are designed to accommodate common cavity dwellers such as Wrens, Finches, Chickadees, Nuthatches and Titmice. The feeders will attract all types of wild birds. The houses and feeders are constructed of Western Red Cedar or Pine shingles for the roof, exterior grade ply-board for the walls, floor and underlying roof board and kiln-dried hardwoods, pine and poly-resin for the details. They are finished with outdoor, non-toxic paint. With time, all products will need to be refinished when left outdoors. The shingles (cedar) will patina to a silvery color and the piece will become weathered and distressed. No chemicals or sealants have been used which might be harmful to wildlife.